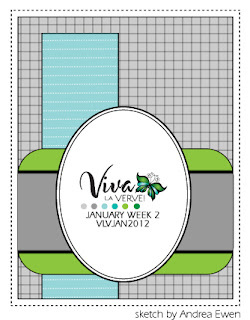 Today I'm sharing a card that I made for Just Magnolia and Hanglar Stanglar's Anything Goes challenge. It's cool but clear and sunny here today, so I decided to make a spring colored card. Here's a closer look at the colored image. I used shades of coral for her dress and the accent flowers to pick up the color of the polka dots in the dp. I used a Viva La Verve layout from January that I had not gotten around to using previously. Here's Andrea's great sketch. 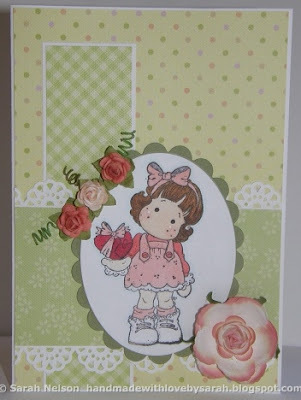 Papers: white, olive green, dps from K & Co. Brenda Walton "Small Wonders Girl"
so very sweet image, lovely flowers and great pattered border punch! 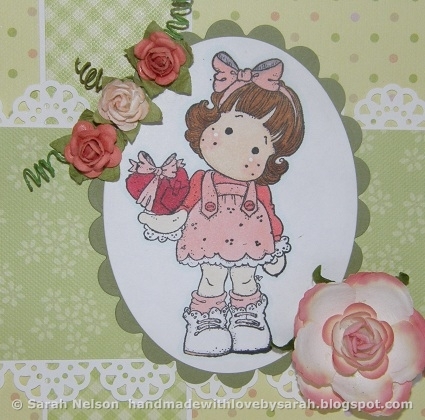 Hi Sarah, your card is so darling!! I love the sketch that you used and the DP's are perfect for Spring! Thank you so much for joining the Just Magnolia and hAnglar and stAnglar Challenge Blog! I hope you join us again soon!